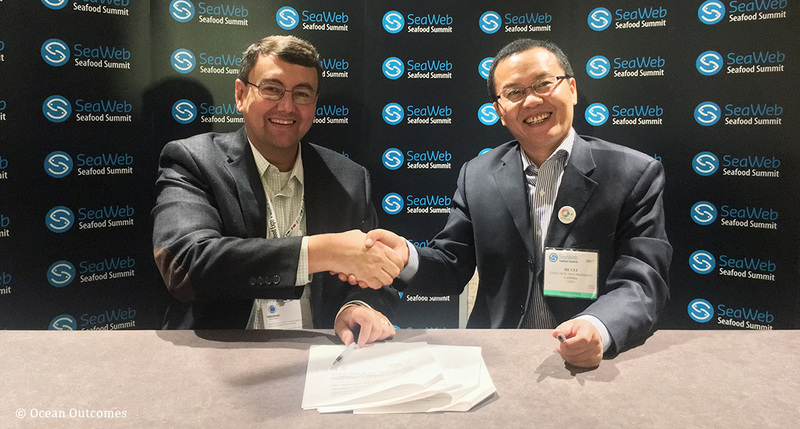 O2 and CAPPMA, a Chinese seafood industry group representing over 1,800 Chinese seafood players, sign agreement at Seaweb Seafood Summit to work towards more sustainable fisheries and responsible aquaculture practices in China. Dr. Cui, who leads the China Aquatic Products Processing and Marketing Alliance (CAPPMA), China’s leading seafood trade association, shared insights into Chinese fishery management reform plans at the Summit and committed to working with O2 to implement these changes. According to Cui, this includes setting upper limits on the total harvestable volumes of wild fisheries to reduce catches from 13 million metric tons in 2015 to 10 million metric tons in 2020, reducing fleet capacity, increasing the number and size of marine protected areas, and piloting total allowable catch (TAC) focused management measures based on scientific guidance. As China produces 35% of the world’s wild and farmed seafood and is home to 25% of the world’s fishing fleet, the announcement of management reform and the Memorandum of Understanding (MoU) between O2 and CAPPMA is welcome news on World Oceans Day. The initial focus of the MoU between CAPPMA and O2 includes a commitment to support, develop, launch, and implement fishery improvement projects across China. Priority fisheries in the near future include the Red Swimming Crab fishery in the south East China Sea, the Japanese Flying Squid fishery harvested mainly from the north Yellow Sea, and clam fisheries of coastal Bohai Sea and Yellow Sea. The two parties will also take joint effort to help more Chinese fish and shellfish farms meet ASC standards. China Aquatic Products Processing and Marketing Alliance (CAPPMA) was founded in 1994 as a national non-profit organization directed under the Ministry of Agriculture. CAPPMA consists of seafood producers, processors, distributors, suppliers, and institutions for fisheries research and education, as well as relevant social entities and insiders that provide various services for seafood processing and marketing. Since 2009, CAPPMA has been listed as one of the best-run national industry associations by Ministry of Civil Affairs of China. Ocean Outcomes works with commercial fisheries, seafood industry, local communities, and NGOs, to develop and implement creative solutions towards more sustainable fisheries. Ocean Outcomes’ science-based fishery improvement initiatives include fishery assessments, supply chain analysis, buyer engagement, traceability programs, fishery improvement projects, and stakeholder convening. Demand for sustainable seafood is at an all-time high, but many of the world’s commercial fisheries remain at risk of overfishing, poaching, and other problems. By restoring and protecting wild fisheries, Ocean Outcomes supports the long-term health of local communities, seafood supply chains, and the ocean resources on which we all depend.